Delicate, elegant, exquisitely feminine, rich, fabulous, legendary, magical and poetically mystical are the properties that are immediately released or gently emerge from the work of Andriana Marinova (b. 1961), a Bulgarian master-artist of great artistic merit and repute. ‘Woven Emotions’, the title to the exhibition in the Monet Gallery at Cavalieri Art Hotel (October 2016) is essentially retrospective and therefore representative of a thirty-year career and, itinerant as it has been previously displayed in the Newman Gallery in Washington DC, USA and at the Cite Internationale des Arts and Espace Culturel Bulgare in Paris. The exhibition includes classical woven tapestry, textile sculptures and jewellery. It is by far not the usual fare the Maltese are continually exposed to, while the vision and message the works convey ‘are straight forward and easy to grasp’. The artist is a graduate at the National Academy of Arts, Sofia with a major in textile (1983). Since Bulgaria has a millenary art history seeped in local folklore with a grand tradition in woven carpets and elements of national costume it is quite comprehensible that Andriana experiments with materials and techniques in tapestry or arras. The works in the exhibition clearly demonstrate this experimental process that could be regarded as revolutionary rather than simply progressive. 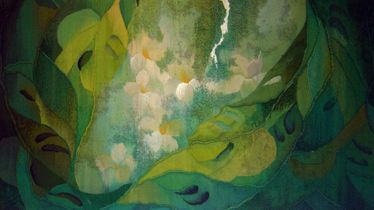 Her art develops from the traditional hanging mural to three dimensional sculptural pieces. In reality she fuses a millenary craft tradition to modern notions of art with a certain sense of effortlessness but with boundless risks. She consolidates a unifying concept of tapestry transformed into a sculptural expression. She demonstrates an almost inconceivable use of macramé applied to metal, wood and glass without losing the legibility of the traditional use of woven silk and wool. I must admit that this is a great feat in reversing the purely decorative character of ‘classical’ tapestry without losing along the way her passion for the cult of beauty with massive doses of bravura and virtuosity. She unifies art and craft, tradition and experiment, classical and romantic notions with refined expertise. Her work incorporates sacred symbols, biblical and scriptural images, plant motifs and medieval murals. Lately she finds inspiration in zoomorphic motifs that reveal thorough knowledge of anatomy and movement of birds, fish and insects in an original aesthetic manner. 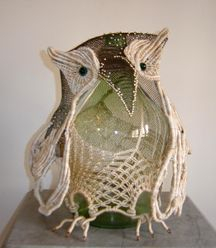 An excellent example is ‘Wisdom’, an owl with a body made from glass and finished in silk and wool decorated with pearls on a copper wire skeleton. 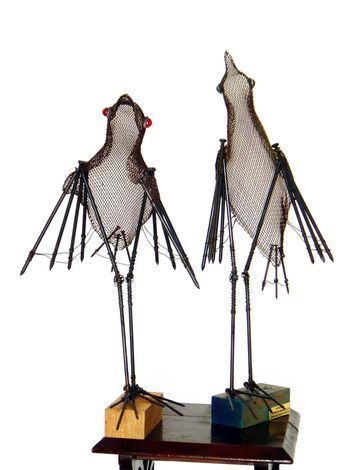 Or still quite striking: ‘In the Reeds’, a pair of waders or stilts, made from nails and wire mesh which, with ‘Love in the Air’, mating birds, and ‘On the Beach’, a seagull resting on the foreshore can be considered a perfect variation on a theme. The artist transforms textile into an instrument to model art objects in space turning two dimensional images into sculpture retaining the colour of wool and silk but in the process adopting other media such as wood, metal, glass, wire, wire mesh and nails. The result is aesthetically beautiful and emotionally moving.